Currently January 15th, and I’m sipping coffee lovely café in Rotorua waiting while a warm gentle rain falls outside. I’m behind because I’ve been going nonstop…and since my flight to Wellington doesn’t leave for 6 hours, I finally have some time to type. We last left off after Ruth and Raoul showed me the city of Auckland in one day. I woke up in their apartment reflecting on how our perception of life changes when with aging. At their retirement village, nearly everyone volunteers on a committee, from managing the newsletter to resolving tech issues, both of which are a few of the tasks Raoul has undertaken. He laughs as he says he looks forward to retiring from retirement. Work gives a sense of purpose, and when you’re helping others – a sense of fulfillment. He is also a very good artist, especially with portraits. The eyes of his paintings tell a profound story, something I imagine he is keen at after a life of work in social services. Would you believe that morning I was handed off to another family? My third in just as many days – I had officially become a rugby ball. But there are no complaints from me. Next up is Rodger. He is perhaps among the most enjoyable people I’ve met. He has a sharp and witty sense of humor, and is very smart and often cracking a grin. 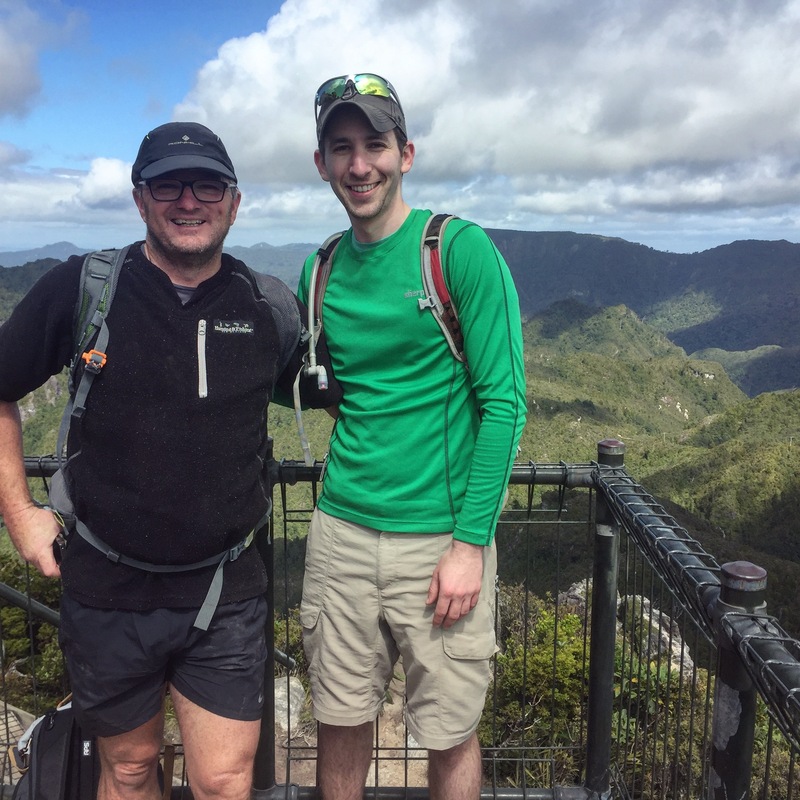 He’s the type of person you could talk to for hours, and hours were had as he drove me around a good portion of New Zealand. Rodger grew up near the town of Thames, a small town that was a port for the logging industry in the 1800s. In high school, Rodger signed up to be an exchange student for a year in the United States in 1983. He didn’t get to select where he would get to go, and fate placed him in Wichita, Kansas. Probably not the first place a new young visitor would want to live in America, but Rodger remembers that year very fondly. To him, Wichita was a huge city. I wonder if the personalities of the family with whom he stayed rubbed off on him a little bit. They were my uncle and aunt, Vic and Ruth, also people with whom I can talk to for hours. To them I owe a lot of gratitude for getting me in touch with Rodger. We drove through the countryside west of Auckland, which is absolutely beautiful. Though Hobbiton was filmed near Matamata further south (more on that later), the entire region is just beautiful rolling hills and dairy farmland. It was about an hour drive to Thames. Thames is a town which you can drive through in about 2 minutes, but that tour was reserved for later…we had to get to the beach. So I threw my bags in the house, except the guitar of course, and hopped back in the car with his kids. 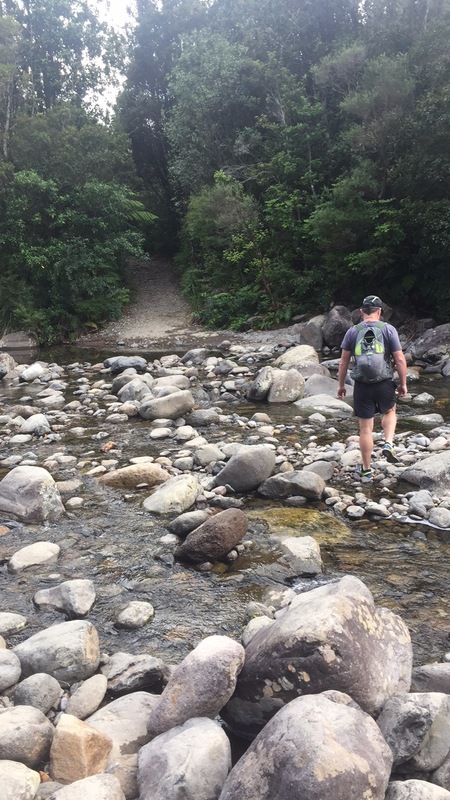 Next we were driving through the Coromandel Peninsula – a complete change in scenery. Towering forests with dramatic cliffs, which were lava tubes preserved after the exterior of volcanoes had eroded away. After 45 minutes we found ourselves in Whangamata (pronounced fungumaTAH). And here I was hosted by my aunt and uncle’s former exchange student’s girlfriend’s parents. Somebody joked that I was one degree away from Kevin Bacon at that point, which gave me a chuckle. 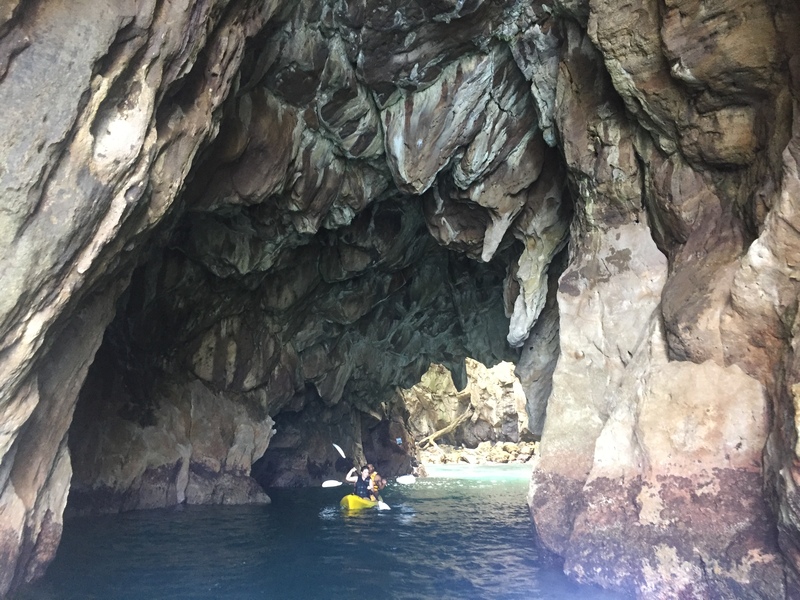 What followed next was paddleboarding in the bay and a boat ride out to Donut Island – an appropriately named island as it is hollow and the middle is only accessible by navigating a narrow cave by board or kayak. My jaw dropped, as it is absolutely stunning, the photo truly will not do it justice. Glad I brought my guitar because playing a few songs was the least I could do to say thank you for the experience. The previous night, while driving with R+R, we listened to news and heard news about paramedics going on strike. Perhaps it was no mere coincidence that Rodger’s son Lachlan is a paramedic. There are a lot of wonderful things about healthcare that I’ll discuss a bit later, but suffice to say there are still some major issues. 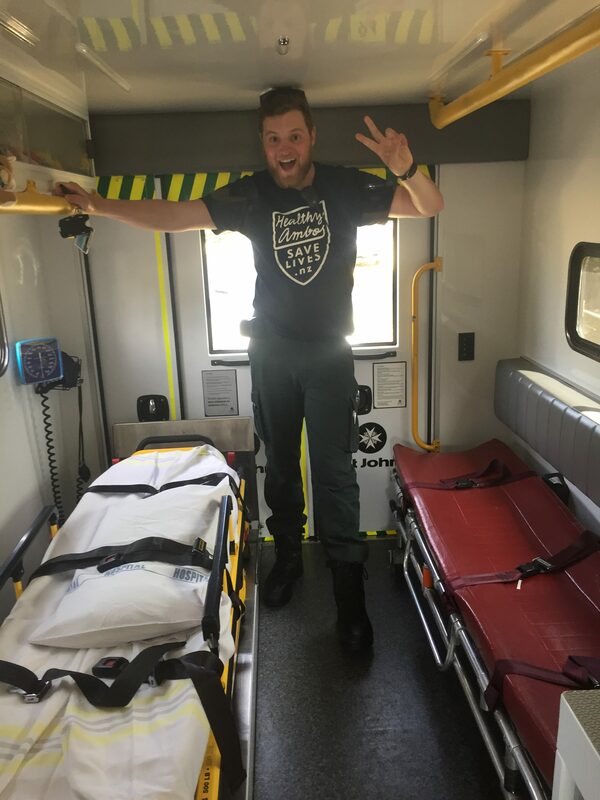 Lachlan often drives the ambulance by himself. Now we drive by ourselves lots, but not when there’s a person in the back experiencing a medical emergency. He is faced with the impossible decision to resuscitate or tend his patient in the back, or go up front and drive to the hospital. In addition, a large proportion of paramedics are volunteers – 70% in rural communities. These volunteers are trained in CPR only – not good. Very not good. Preferable to be able to prevent patients going downhill to prevent CPR if possible. Also they are working longer – 9 hours without a break. These are all reasons why paramedics are on strike. The government responded by cutting wages by 20% to all those remaining on strike. It’s an interesting bullying tactic that will only strengthen the resolve of the paramedics. Lachlan has a masters degree and his advanced training makes him really good at what he does. He is trained to talk to a physician by phone and perform procedures. He has a wide variety of medications available at his disposal. He knows doses for adults and pediatric patients. In short, he’s a badass. I thanked him for his service to his country, which is a strange thing to say coming from a visitor using a phrase usually meant for military – but I really meant it. We drove back to Thames and I got to meet Rodgers wife, Anne Marie, who had finished her shift as a nurse in the emergency department. Rodger, by the way, is a radiology technician and hospital administrator. Quite a bit of medical learning for me before stepping foot in clinic. Woke up early in the morning. Packed my bag with 3L of water and food. Threw on my only pair of sneakers which are also serving as my hiking boots. Hopped in the car with Rodger. 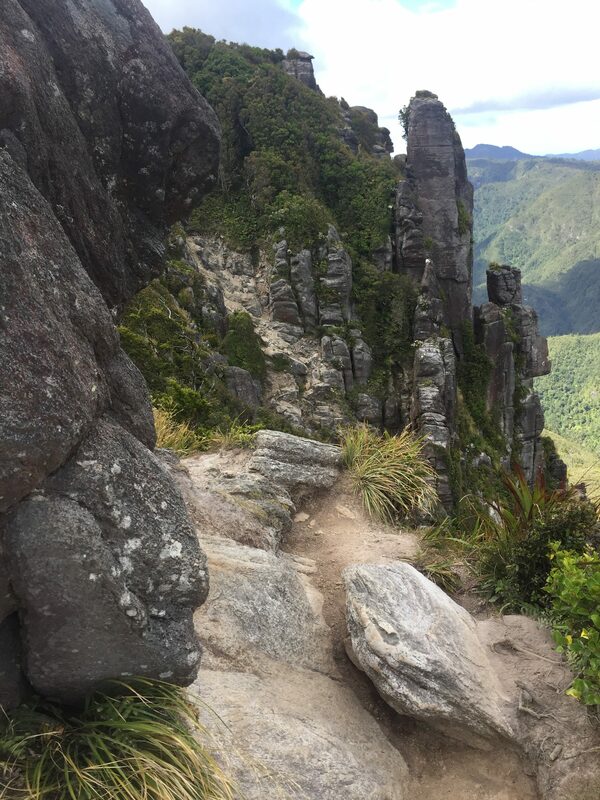 Off to hike The Pinnacles via the Kauaeranga Kauri Trail in the middle of the Coromandel Peninsula. This was a 15 km hike, with an elevation of 90 flights according to my phone, although it felt like much more than that. A good proportion of the hike are steep steps. It is a beautiful trail, and it is very well maintained. 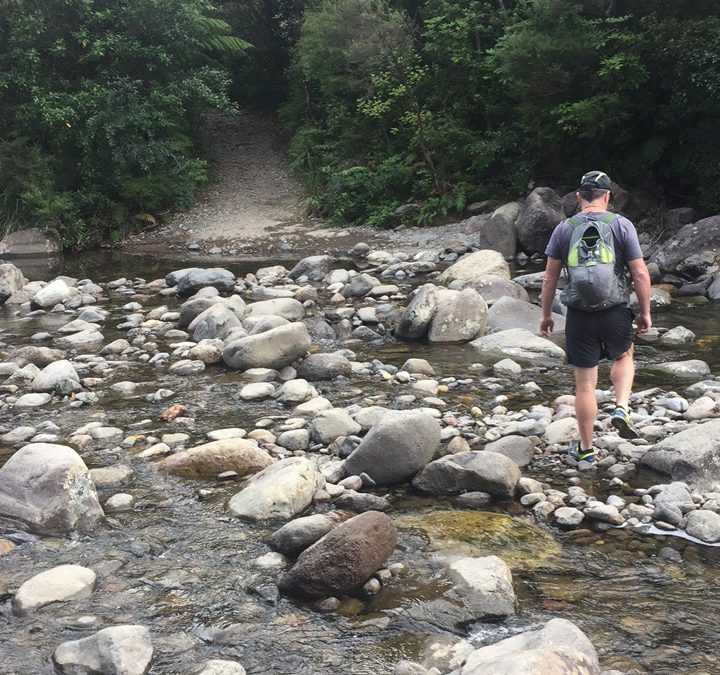 At the starts of the trail there is a washing station where you disinfect your shoes to protect the kauri trees which were once plentiful in the forest. Relative to some hikes I’ve done in the states, this trail was incredibly well marked and maintained. There were alternate pathways and bridges available in case of flooding. The forest was lush and green, consisting of many palms and ferns. The trail winds around a creek, and offers many beautiful sights. After a while your mind seems to connect with the trail and you feel like your connected to this beautiful earth. There were many moments where I thought, “I am here now”. Rodger had a quick witty comment for every hiker we passed, and it served as continuous entertainment for me. The forest opens up to an open expanse where you see the Pinnacles towering above in the distance. It’s a bit of a treacherous climb to the top. Multiple ladders, and bars driven deep into the rock. You have to boulder, using all four limbs to ascend. At the top, you look out and can see water on both ends of the wide peninsula. Rodger and I take a photo together. Climbing up isn’t about being the tallest. It’s about seeing more. Rodger and I talked about so many things during that hike from politics to healthcare to relationships and family. We took a dip in a river nearby afterwards and the cold water felt incredible for tired legs. Rodger is on a long road to recovery from both injury and illness, and his strength and determination during that climb inspired me. Then we went to the Thames hospital, still sweaty from the climb. Rodger gave me a tour of the 48 bed hospital. It was beautiful and all the staff were very friendly. I was attracted to a room with a piano, which was donated to the hospital by Rodger’s late father. In this room was also a library of books and magazines and a wide selection of board games. I reckon this room provides healing 24/7. That evening, I enjoyed a fish and chips picnic with Rodger’s family on the beach while the sun set. He was kind enough to drive me back to Matamata after the tour. From there I caught a bus to Rotorua to start the next chapter of my trip. I arrived at my AirBnb, grabbed some groceries for the week, and went to bed, thinking about eye clinic in the morning. 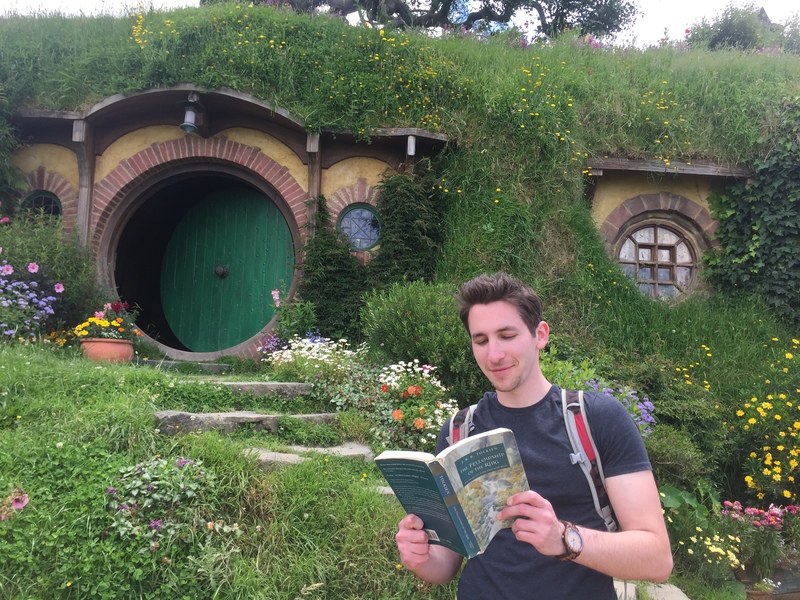 Reading Lord of the Rings in front of Bilbo’s home.